Fits models: Magimix 3150 and 3200. ..
Magimix 3200 / 3200XL / 3150 Bowl with Black Handle ..
Magimix 3200 / 3200XL / 3150 Bowl with White Handle. .. 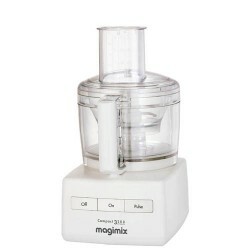 Fits Magimix food processor 3200 ..
Lid only, for Magimix 3200XL. Pusher Set not included. To allow the Non XL 3200 models to process slicing/grating in the large bowl, 3 parts can be purchased: The XL lid, Disc Support XL model a..
Magimix Disc Support for Food Processor 3150, 3200, 4200, 5200. ..
Magimix Mini Blade use for Magimix 3150, 3200/3200XL, 4200/4200XL, 5200/5200XL mini bowl. ..
Magimix Mini Bowl x200, for Magimix 3150, 3200/3200XL, 4200/4200XL, 5200/5200XL ..
Reversible 2mm Grating Slicing Disc for Magimix Food Processor Series 200 Fits Magimix models: 3200, 4200, 5200 and 3150, 4150, 5150. Also fits Magimix 2100, 3100, 4100, 5100, however, will need..
Magimix Rubber Foot Round Black ..
Magimix Rubber Foot Round Black Set 4 .. Suitable for Magimix Food Processor 3000, 4000,5000, Compact 2100,3100, 3150, and 4100, 5100, also new models 3200/3200XL, 4200/4200XL, 5200/5200XL, holds up to 6 discs. ..
Magimix BlenderMix attachment for 3200 / 3200XL / 3150: Simple yet effective, the Blendermix attachment, fitted into the main bowl or lid and used in conjuction with your masterblade turns the Magi.. Ideal for extracting a clear juice from all types of citrus fruit. Two cones provided for smaller fruits such as lemons and limes and larger fruits such as oranges and grapefruit. Fits Magimix mode..
Magimix Citrus Press Large Cone ..
Magimix Citrus Press Small Cone, suits Magimix 3150, 3200 / 3200XL ..
Magimix Pusher Use with Magimix Food Processor 3000,4000,5000, Compact 2100,3100, 3150, 4100,5100 and new models 3200, 4200, 5200 .. Ideal for keeping the main bladed knife and sharp discs out of the way in the busy kitchen enviroment. storage for four discs, dough blade, main metal blade and egg whisk. This storage box c.. This creative kit includes: A julienne disc (2mm x 2mm), an extra wide julienne disc (2mm x 12mm) and a fluted disc (2mm) Storage Box for 3 Discs. Suitable for models: CS3150 / CS3200 / CS3200XL ..
Magimix Extra Wide Julienne Disc 12mm x 2mm Fits models: 3150, 3200, 4200, 5200, 3200XL, 4200XL, 5200XL ..
Magimix Fluted Disc 12mm x 2mm Fits models: 3150, 3200, 4200, 5200, 3200XL, 4200XL, 5200XL ..
Magimix Grating Disc 2mm Fits models: 3150, 3200, 4200, 5200 and 3200XL, 4200XL, 5200XL ..
Magimix Food Processor Grating Disc 4mm Fits models: 3150, 3200, 4200, 5200, 3200XL, 4200XL, 5200XL ..
Magimix Grating Disc 6mm Fits models: 3150, 3200, 4200, 5200, 3200XL, 4200XL, 5200XL ..
Magimix Instruction & Recipe Book: Includes 100 exciting ideas from starters to desserts ..
Magimix Julienne Disc 2mm x 2mm fits models: 3150, 3200, 4200, 5200, 3200XL, 4200XL, 5200XL ..
Magimix Parmesan Disc Fits models: 3150, 3200, 4200, 5200, 3200XL, 4200XL, 5200XL ..
Reversible 4mm Grating Slicing Disc for Magimix Food Processor Series 200 Fits Magimix models: 3200, 4200, 5200 and 3150, 4150, 5150 Also fits Magimix 2100, 3100, 4100, 5100, however, will ..
Magimix Slicing Disc 2mm Fits models: 3150, 3200, 4200, 5200, 3200XL, 4200XL, 5200XL ..
Magimix Slicing Disc 4mm Fits models: 3150, 3200, 4200, 5200, 3200XL, 4200XL, 5200XL ..
Magimix Slicing Disc 6mm Fits models: 3150, 3200, 4200, 5200, 3200XL, 4200XL, 5200XL .. Perfect to extract from juices, smoothies and thick and creamy jus or purée from most raw and cooked fruit and vegetables. Patended by Magimix. Fits Magimix models: 3150 and 3200 and 3200XL .. Fits Magimix models: 3000 4000 5000, 2100 3100 4100 5100, also 3150, 3200, 4200 and 5200 For extracting juice from vegetables including carrots, celery, beetroot and hard fruits including apples..